When our daughter, Megan, announced she was getting married, all my friends asked if I was planning to make her wedding dress to which I replied “no way, I want to be her friend on the big day”. 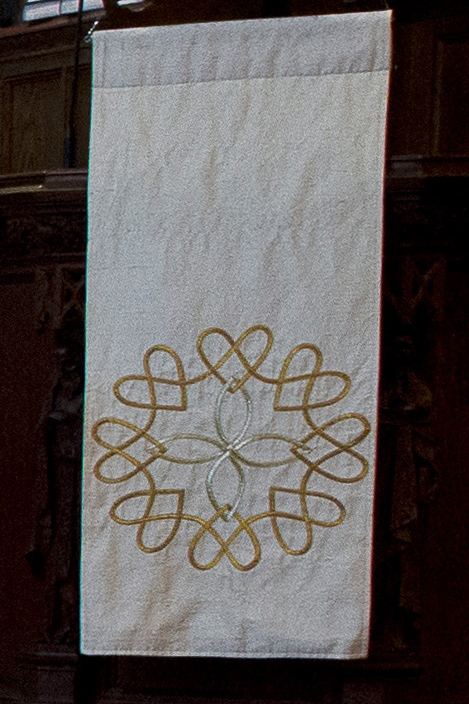 I did, however, offer to make some vestments! I have always loved Celtic knots; blame my Irish heritage. Megan’s name means wind of fire and that she is… my wonderful passionate daughter. As I began thinking of which knots to use, I found myself focusing on a conversation I had had with a newer member of our congregation. He was living into the reality of life as a gay man having come from a place where that was simply not safe. He would sit toward the back of the church and as I shared the Peace with him, he would often be in tears saying over and over again “love is spoken here, love is spoken here”. So it is I created the knot of hearts entwined to place on the pulpit reminding us all that love is spoken here. It was perfect for Megan’s wedding! 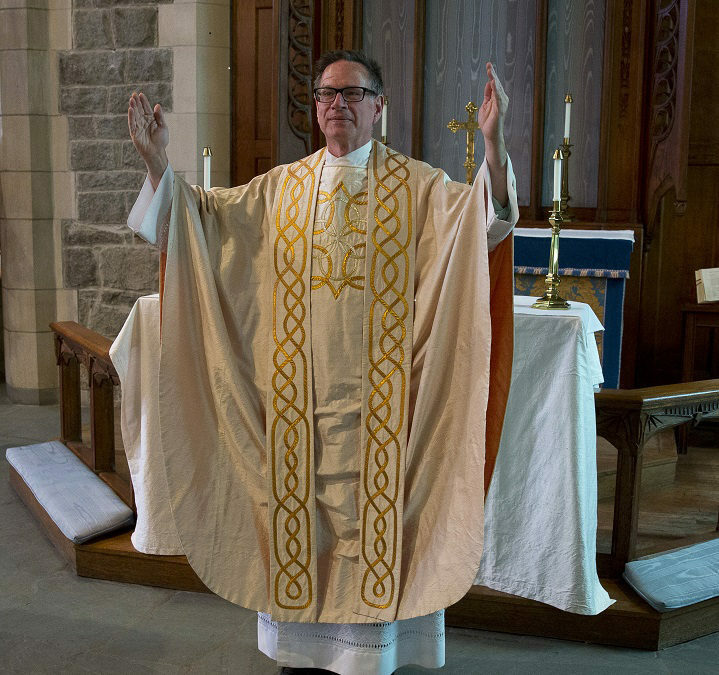 The chasuble and stole were next. 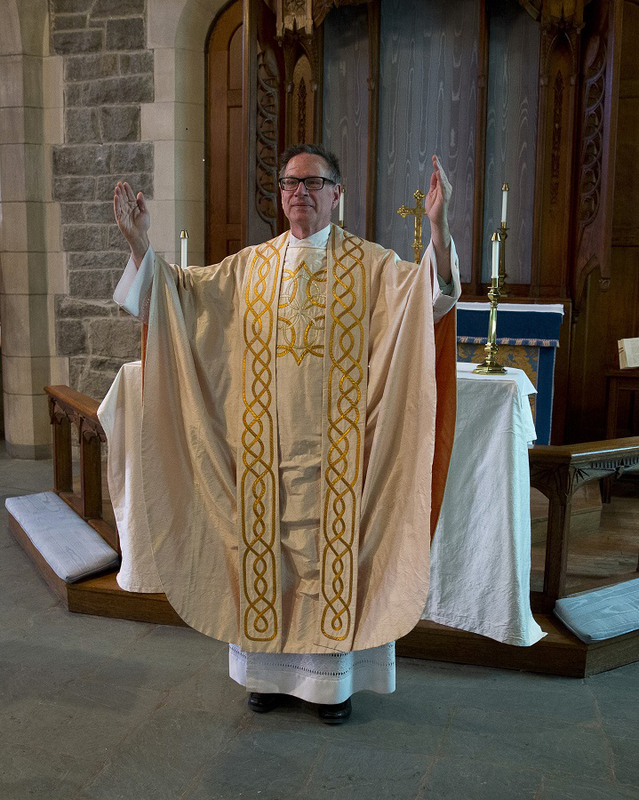 I used a beautiful cross on the chasuble but the stole has such meaning for me. It is made from one continuous strand woven over, under, over, under in ever changing patterns. Each side is different – just as the two of them are different and just as the two of them bring their own unique gifts to the marriage, the hope is they will join those gifts together to become a more complete, more whole human each in their own right but connected always. I am grateful to say that is how life has been for them and now their three beautiful children. Thanks be to God!